Our hotel at the beach provides you with everything you need to make the most of your trip to Point Pleasant Beach, New Jersey. 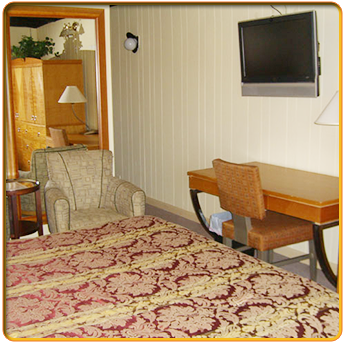 At The Amethyst Beach Motel, we strive to make our guests feel like family, so we provide you with a number of amenities. We even show you the best attractions in the area. Whether you rent one of our rooms or one of our vacation apartments, we will take great care of you and your traveling companions. Spend an afternoon relaxing poolside. We have a heated pool and a beautiful patio area. There is plenty of sunshine and shade, and it features smoking and nonsmoking sections. Start each day off right with a continental breakfast served by the pool. We have bagels, muffins, coffee, and tea. There is a variety of other foods available for an additional charge. 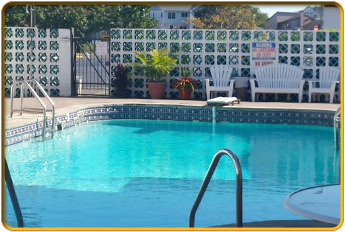 New for 2017 large patio Barbecue area with plenty of tables and Preparation areas, enjoy grilling and save on unneeded expense, Amethyst is all about giving our guests a wonderfully affordable experience while having the best access to all the wonderful attractions of Point Beach NJ. We do charge a small resort fee of $12.85 per day, per room. This pays for the discounted beach pass, continental breakfast, and internet access.